Alice In Wonderland subway art at the 50th street station. On my way to my anniversary dinner (9 years married!) 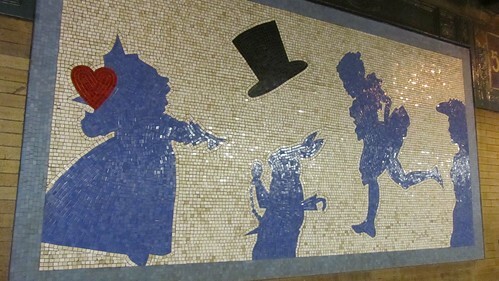 I stopped at the 50th street station to snap a picture of the Alice In Wonderland tile-art. I sometimes feel as though I’ve fallen through my own rabbit hole with New York City as my very own wonderland. Sometimes I’m too big and sometimes I’m too small, often I’m too slow, most days I don’t understand the language (seriously, I’ve never heard so many different languages in my life! ), but I always want to know what’s around the next corner. I met someone recently who was from another state just like me. She commented that you can always tell the locals from the newcomers because the newcomers are willing to stop and talk more. I agree, I do chit-chat and smile more than some others. In Austin, I used to always thank my bus driver (you know for getting me to my destination safely) and here in New York I rarely see the subway conductor. When I do see them they are so distracted with making sure people are on or off and usually they are barking out orders on their intercoms. But I still stop and say thank you or wave and smile at them. They did after all just manage to control a speeding train well enough for me to live to tell the tail. They always seem so shocked or put off by my thanks. I suppose you can take the girl out of Texas but you can’t take Texas out of the girl? My husband noted that this is the 3rd city we’ve lived in for an anniversary and that this one has more people than the other two combined. I think it would be easy to get lost in all the hustle and bustle and sometimes I do get carried away a little but thankfully I’m not alone. I venture out, go to work, make friends, knit, run, and no matter what I know I’m part of a two-person team. One of us can always ground the other. It seems like everyone I know has roommates or a teeny-tiny apartment or an undesirable neighborhood. I’m always grateful for moving to New York on our terms. When people marvel at the fact that we came down here in September for an exploratory visit and agreed on an apartment halfway through the week, they inevitably ask how that is possible, Paul likes to respond “I have a wife.” It’s true I do a lot but so does he. Neither one of us has to figure it all out alone. Happy 9 year wedding anniversary to us. 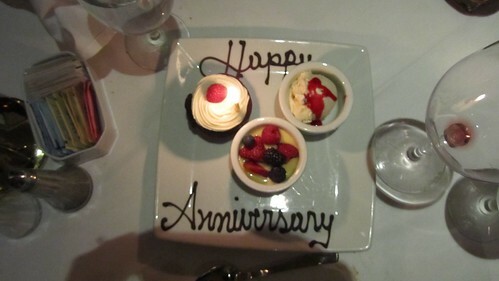 This entry was posted in everything i've blogged, food, observations and tagged art, dining out, Firsts, subway. Bookmark the permalink.